Capture documents or webcam images, load local images and PDF files; Read barcodes and OCR images to text; Save images to local or remote disk, database and document library. Scan documents using the complete Dynamic .NET TWAIN feature set. All features (scan, load, edit, save, ocr, read barcode) implemented. Load an image from your local disk, add annotations, such as text, rectangles, lines and eclipses, and save. Load local images and perform OCR to get text or searchable PDFs. 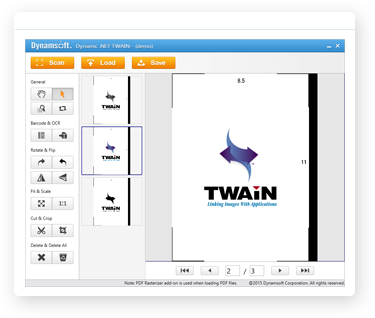 Convert PDF files into image PDFs using Dynamic .NET TWAIN PDF Module. 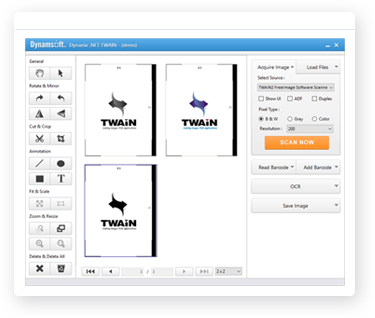 After you download and install the 30-day free trial of Dynamic .NET TWAIN, you can find the basic samples in \Samples folder under the installation folder.